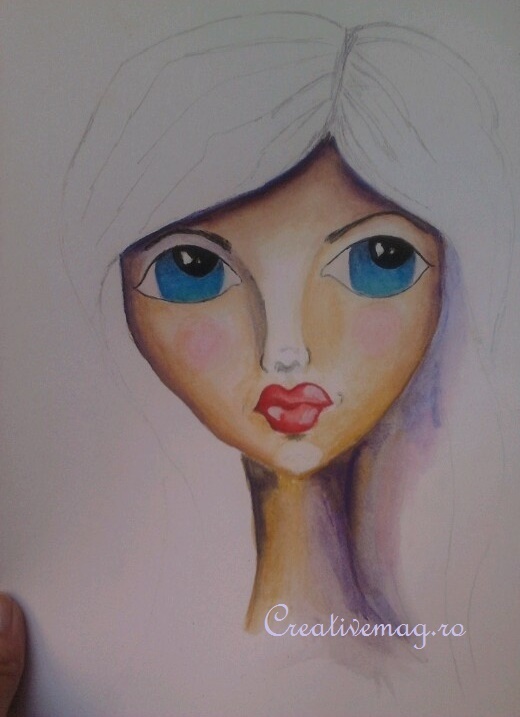 One of my first drawings during the class offering by Andrea Gomoll, a try to draw and paint whimsical faces, a mix between a face with realistic features and some fantastic, whimsical ones. I haven’t got the chance to finish her, but in art journaling the most important thing is the process, not the end result. Maybe I’ll finish her one day. The girl was painted in watercolor on 230 gr paper. Unul din primele mele desene in timpul unui curs online oferit de Andrea Gomoll, incercare de a desena si picta fete fantastice (whimsical), un amestec intre o fata cu trasaturi reale si una cu trasaturi fantastice, de poveste. Nici astazi nu am apucat sa termin de colorat parul si fundalul, dar in art journlaing mai important este procesul in sine decat rezultatul final. Poate am sa termin desenul intr-o zi. Fata din poza de mai sus a fost pictata in acuarela pe hartie de 230 gr.